Made in Laos from Vietnam War-era bombs, plane parts, and other aluminum scrap, each Peacebomb is hand poured and cast in wood and ash moulds. Each piece gives back to support traditional Laotian livelihoods, village development and further de-mining in Laos. Your purchase contributes to MAG (Mines Advisory Group) to clear some of the 80 million unexploded bombs contaminating land in Laos. 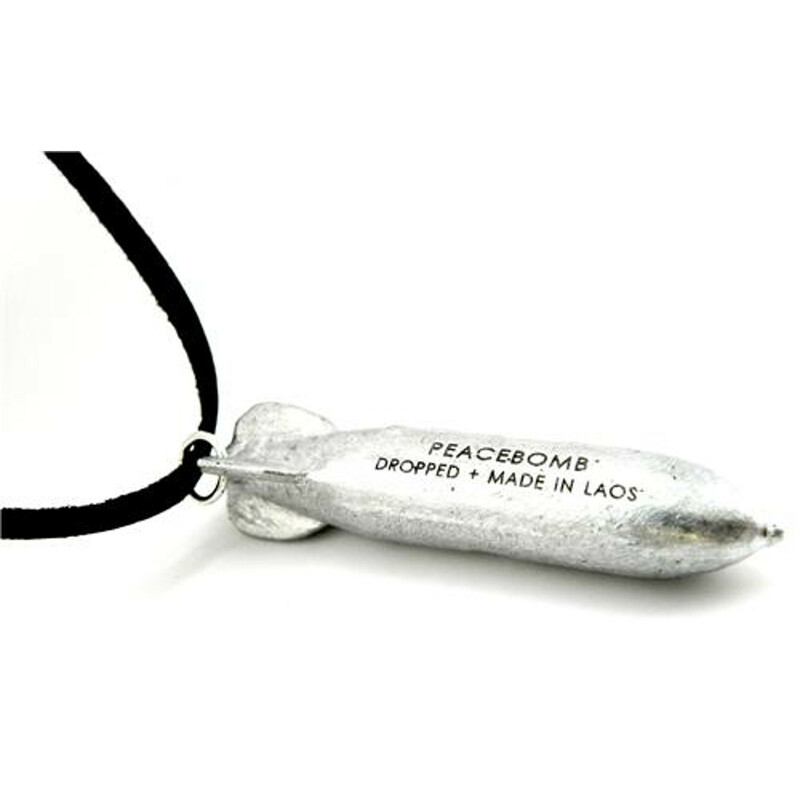 Unisex rocket shaped PeaceBomb Talisman on Black Leather Cord. 3.8cm rocket charm with sterling silver ring attachment. 80cm black deerskin leather with 40cm drop length. Leather cord can be worn constantly and will soften and patina organically over time. 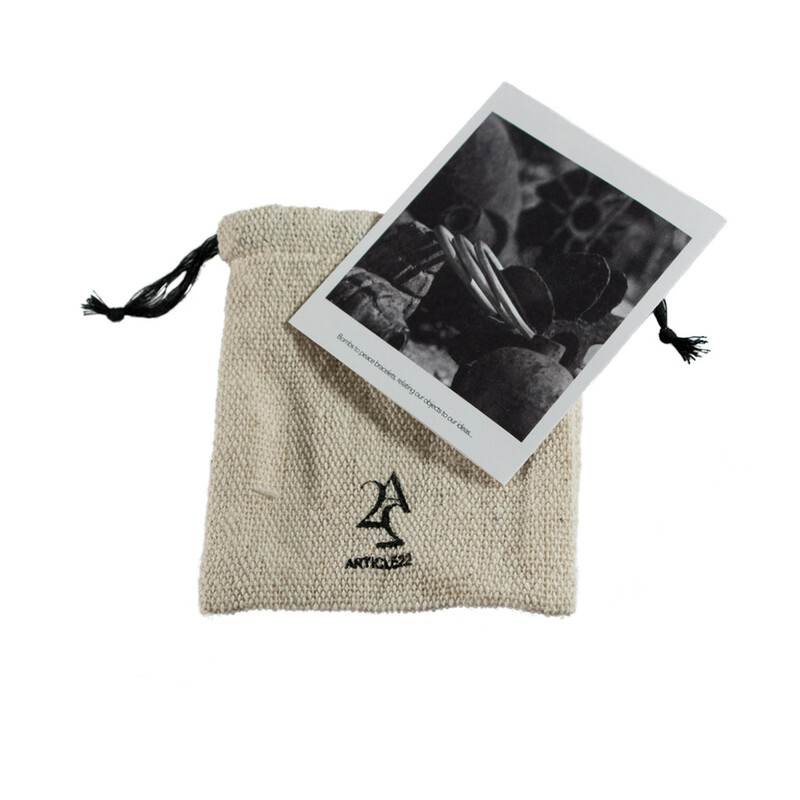 Complete with Article22 story card and handwoven cotton gift pouch. A striking a practical tote bag, perfect for shopping, trips to the beach or weekends away. A zipable main compartment provides that little extra peace of mind. Hand crafted from recycled cement bags by villagers in Cambodia. An elegant necklace with a ring charm made from recycled bomb metal. Chose the chain that suits you best; sterling silver or yellow gold. Stone polished PeaceBomb Dome Earring with sterling silver Tribal Bead bezel. Finished with sterling silver cups, posts and ear nuts. Chic, lightweight and comfortable to wear. If you want a bag that stands out and makes a difference, then go for this one. Perfect as a day bag with room for your books, laptop and phone. Waxed cotton unisex wrist wrap with reclaimed bomb metal tag engraved with the message DROPED + MADE IN LAOS. Real leather unisex wrist wrap with reclaimed bomb metal arrow tag. The arrow represents strength, purpose and a sense of direction. Each PeaceBomb Arrow tag is hand made by melting metal from Vietnam War era aluminum B-52 bombs, fighter jets and scrap metal in an earthen kiln, then pouring the heated metal in wood and ash molds.